The latest payload preparations for Ariane 5’s Flight VA232 are captured above. 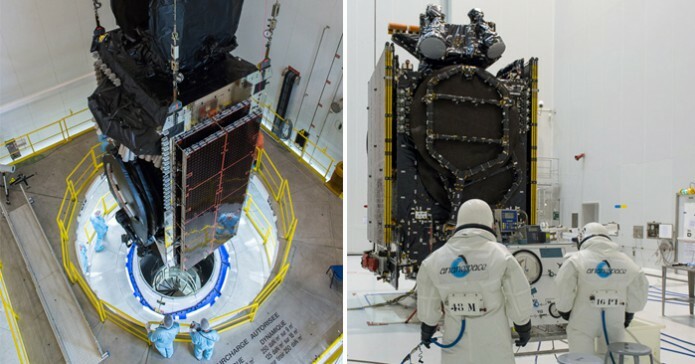 In the photo at left, Intelsat 33e is shown being lowered for integration atop the SYLDA dual-passenger dispenser system; while at right, the Intelsat 36 co-passenger is “topped off” with its onboard propellant. The two satellite passengers for Ariane 5’s August 24 flight – both of which will be orbited at the service of global operator Intelsat – are advancing through their payload preparation phases during parallel activity at the Spaceport in French Guiana. Designated Flight VA232 in Arianespace’s numbering system, the upcoming mission will loft Intelsat 33e and Intelsat 36 to geostationary transfer orbit. It is scheduled as the company’s sixth launch to be performed in 2016, as well as the fourth this year using a heavy-lift Ariane 5. Arianespace’s full launcher family is rounded out by the medium-weight Soyuz and light-lift Vega. 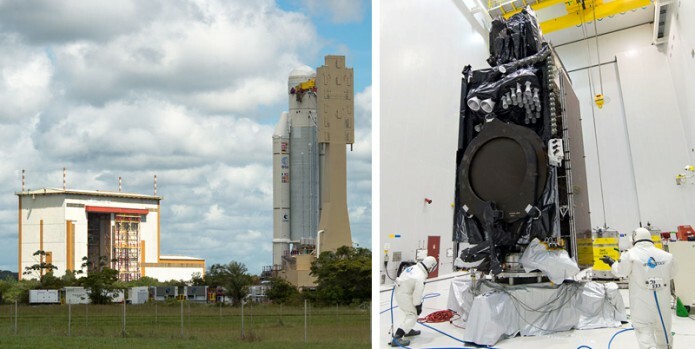 Intelsat 33e – the first of the two payloads to arrive in French Guiana – has completed its initial checkout, and during preparations carried out yesterday, was installed on the launch vehicle’s SYLDA dual-passenger dispenser system. The latter step was performed in the Spaceport’s Final Assembly Building and positions Intelsat 33e for the upper slot of Ariane 5’s payload arrangement. As the second spacecraft of the next-generation Intelsat EpicNG series, Intelsat 33e – which was produced by Boeing – integrates one of the most advanced commercially-available digital payloads in the world. The first Intelsat EpicNG satellite, Intelsat 29e, was successfully delivered to geostationary transfer orbit on an Ariane 5 mission performed in January. Flight VA232’s Intelsat 36 co-passenger marked an important pre-launch milestone of its own yesterday with the loading of onboard propellant, which occurred in the S5A hall of the Spaceport’s S5 payload preparation facility. Following its upcoming transfer to the Final Assembly Building, this spacecraft will be integrated as the August 24 mission’s lower payload. Built by SSL (Space Systems Loral), Intelsat 36 will enhance Intelsat’s premier direct-to-home neighborhood in Africa after reaching its final orbital position.